While it looks like a big win, there is actually some bad news here. That is brewpubs and micros closing for whatever reason. 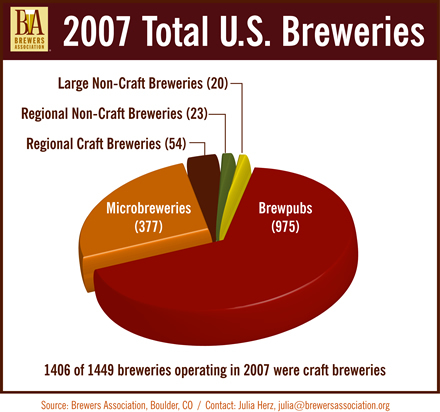 Comparing 2007 with 2006 there were 12 less brewpub and micro breweries closures which is 40 versus 52. Added up that means that 90 places closed in the last two years. On the positive side during the same time frame 94 new places opened in 2006 along with 82 openings in 2007. Added together 176 places opened. An overall growth of 86 new pubs to haunt or hold court. In other news some things stay the same. 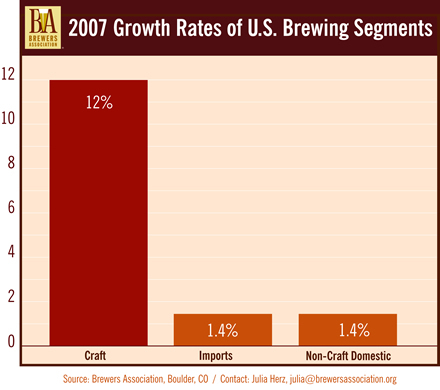 Between 2006 and 2007 there were 20 large brewers and 23 other non craft brewers. Which we believe to be the same as the year before and the year before that. Get all raw the stats right here.